Are you ever surprised by Joy? It is quite likely that you are, if you ever experience it at all. Like its source, Joy isn’t the sort of thing that can be summoned or commanded. The glimpse of Something captures us for fleeting moments, its elusiveness maddening our mortal frames. What was that, just beyond, that we would pursue at whatever expense if only we knew how? My mom always says the stretch of Pacific Coast Highway from Malibu to the 101 is so spectacular that the drive makes her feel like she's on vacation. 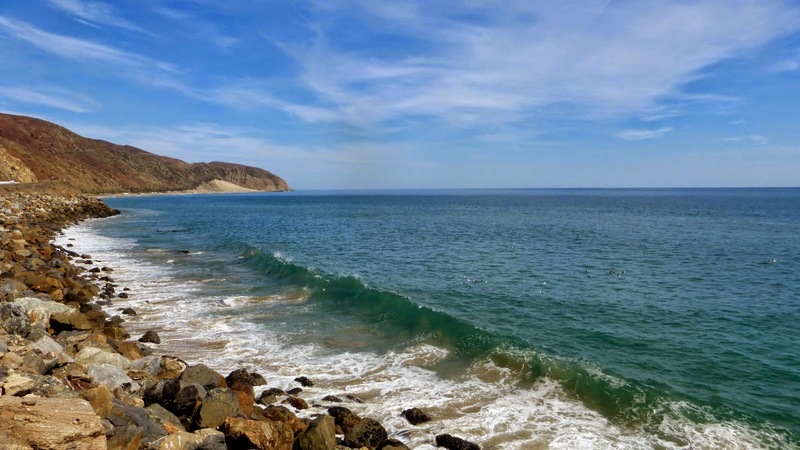 Before the "Great Wall of Malibu" was built (that's the local nickname for the wall of houses and landscaping that entirely block the view of the ocean in many areas and especially in eastern Malibu), the whole trip through Malibu on PCH must have looked like this. 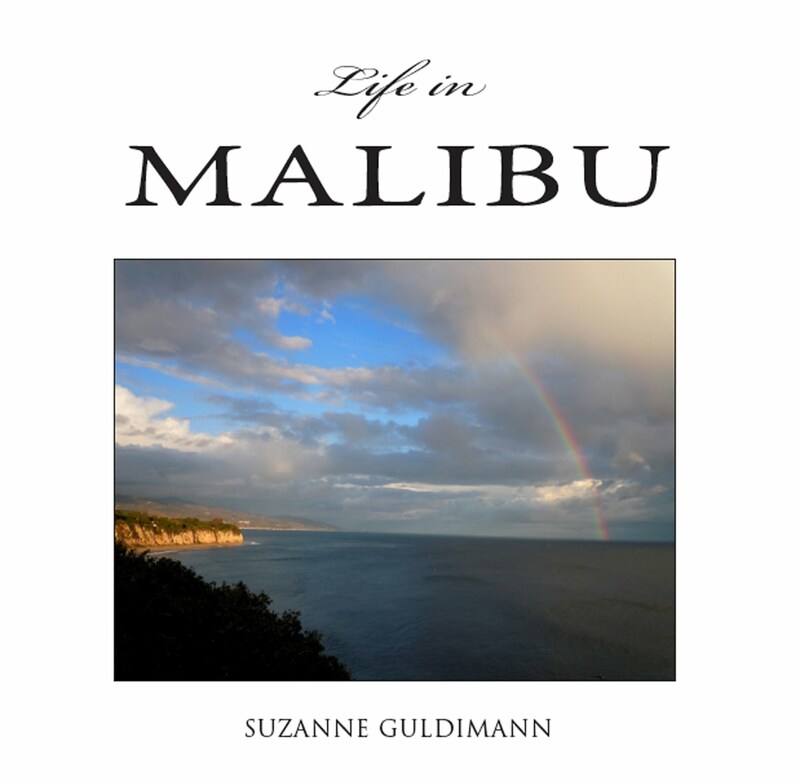 Once you are west of Point Dume, however, it's nothing but sea and sky and mountains most of the way up to the 101. The sign says "27 miles of scenic beauty," but it's more like 12 miles of scenic beauty and 15 miles of garage doors and privacy hedges. 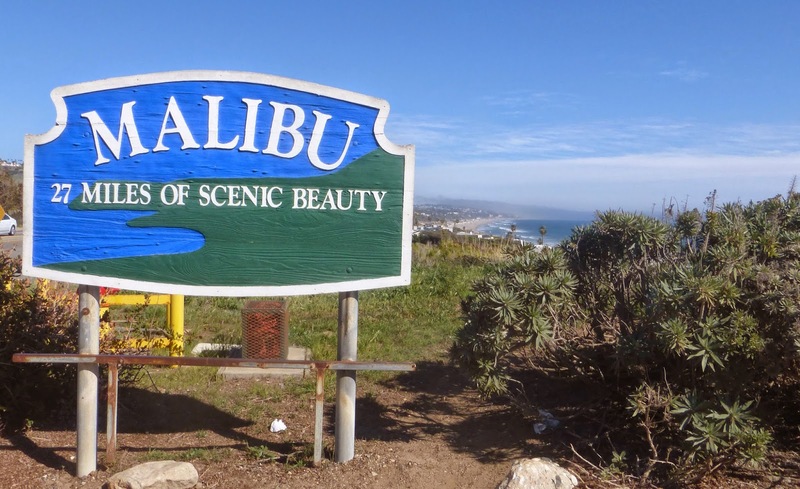 It's ironic that this sign is located here, instead of up by County Line at the Malibu City Limits, since by the time you arrive here, you've already passed much of the scenic beauty that's visible from the road. She and I were on our way home from Ventura when we saw dolphins close to shore, leaping and dancing in the water. We pulled over to watch. It was my mom who spotted the whales: a cow and her calf, close to shore, swimming with the dolphins. 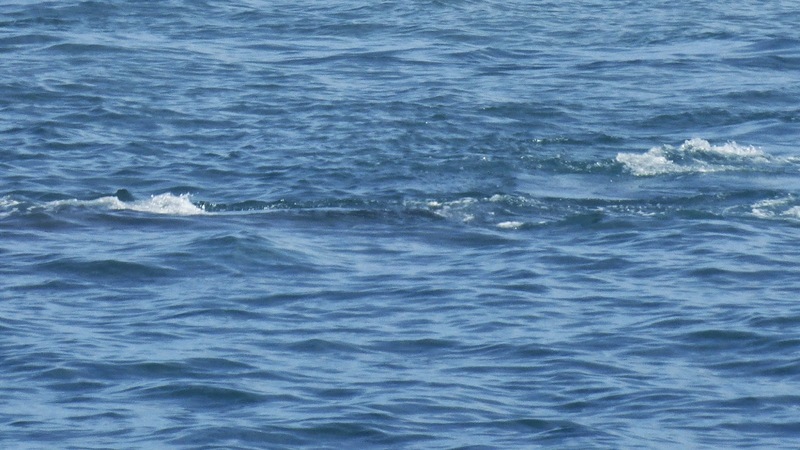 A gray whale and common dolphin in the water off Point Mugu State Park. We were soon joined by other observers. Cars stopped. People pointed and exclaimed. Strangers who had never met before and were unlikely to ever meet again were united in a moment of shared joy. This is joy in the C.S. Lewis sense of something almost divine in its wonder. We watched for almost half an hour as the whales and the dolphins surfaced and submerged, spouted and rolled—flukes, barnacled gray backs and a small—for a whale—head poking out to look around for a moment and then disappear, leaving a whale "footprint" behind. It's hard to capture the moment with a camera. The whales are too elusive, they are only above water for seconds before disappearing back into the ocean. I feel like a Flatlander. These are true three-dimentional beings, flying through the water as if it was air, leaping into the air in the way we might into water, while we humans are trapped on the shore, our feet on the earth. Mama whale, baby whale and a dolphin. There was a pod of around six common bottlenose dolphins in the cove with the whales. They appeared to be extremely excited by the presence of their much larger cousins. The inquisitive baby gray whale pokes her nose out for a look around. 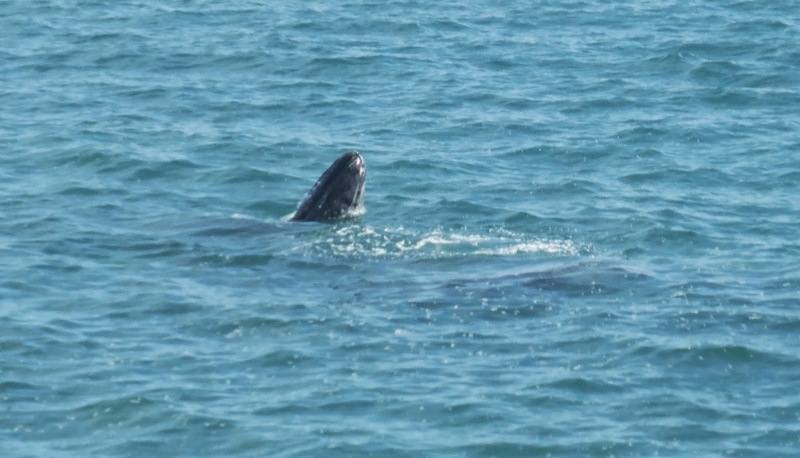 It was a quick peek, not like the prolonged "spyhopping" of adult gray whales. Compared to the size of the nearby dolphins, the whale calf appeared to be around 15 feet long. The cow—a hopelessly prosaic name for something so awe-inspiring—was probably close to 50 feet. Here's a close-up of the adult's blowhole. 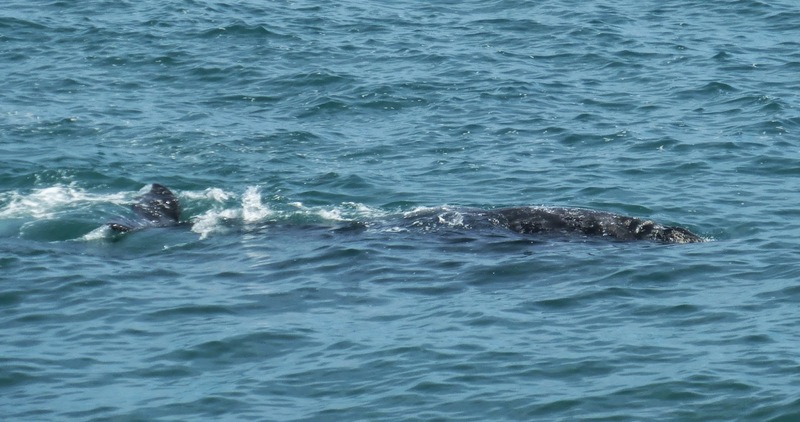 Gray whales have a double opening. This whale has a distinctive patch of barnacles on her back. Mama whale roles over, showing one of her powerful flippers and an expanse of the blotchy gray and white coloring that gives this species its common name. 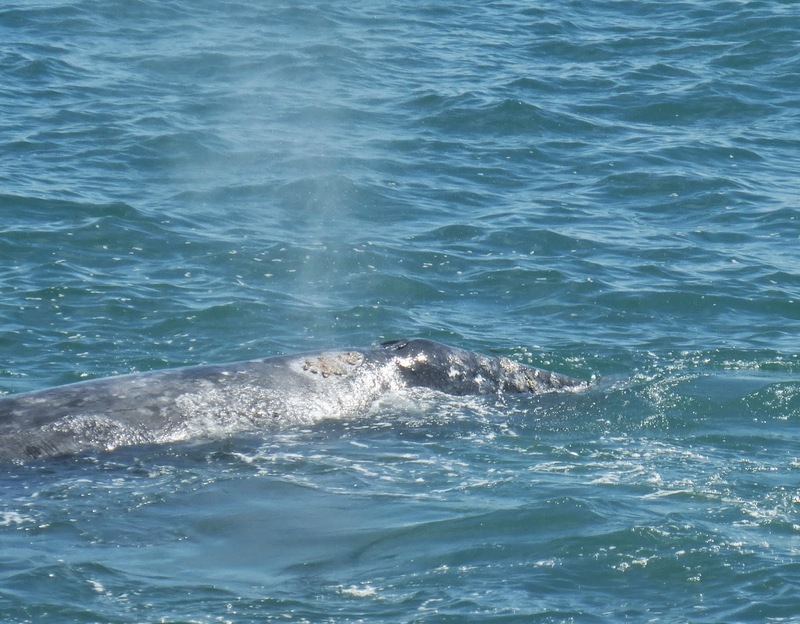 We had a good view of the distinctive dorsal ridges that are characteristic of the gray whale. One last spout—it's easy to see how whales could be mistaken for sea monsters. ...And then the whales were gone, leaving only footprints behind. In the sky over the ocean there was a sunbow that with only a little bit of extra imagination resembled a great celestial whale. We had the chance to have this remarkable experience because that stretch of coast is undeveloped, letting all of us who stopped that day see something extraordinary that would otherwise pass unseen. It's another reminder of why it's important to keep fighting for preservation and conservation.